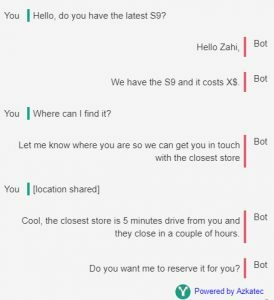 A chatbot will start a conversation with your customers (e.g. thru Facebook or website chat boxes), and it understands their intent and answers their questions. Because customers want answers, if a chatbot is helping them get the job done faster than usual, then they will enjoy the experience. 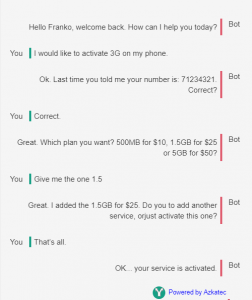 Customer service: Chatbot can handle 80% of your customer service requests, and this could lead to savings of 30% (according to IBM) while freeing your agents for a more interesting and productive work. Do you recall this conversation? 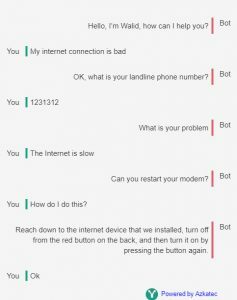 Chatbot to the rescue: A chatbot can recover the conversation and continue from where it left off, as it recalls previous context. Pitch them for products or generate leads: While browsing on a website, the Chatbot can engage users with a conversation in order understand their needs and intent, and then based on intent they can qualify the user as an interested lead, or if they are just browsing.